Smoky Chipotle Nachos | FINEX Cast Iron Cookware Co.
America’s Test Kitchen calls cast iron the “perfect vessel for nachos” and we couldn’t agree more! 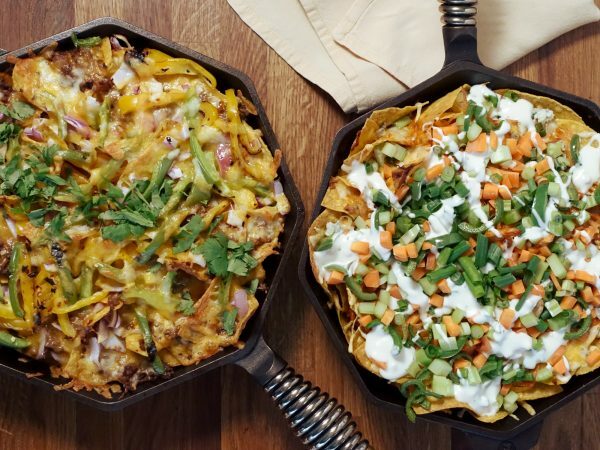 These Smokey Chipotle Nachos (above, left) are based off their Loaded Beef Nachos and are designed to be cooked and served all out of one FINEX 12″ Cast Iron Skillet. In our version, you’ll need an open flame to char two bell peppers so if you aren’t cooking on a gas range, get your torch or camp stove ready. Interested in more nachos? Try our buffalo chicken recipe also pictured above. 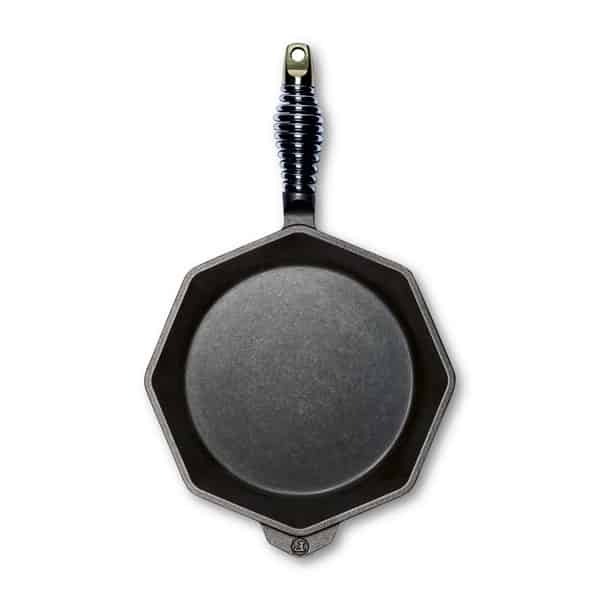 Add vegetable oil to your 12″ FINEX Cast Iron Skillet and heat your stove’s medium setting for a couple minutes, or until a pice of onion sizzles gently in the oil. Add diced onion, let cook for a minute, stir then add beef. Mix to break up meat and cook for 5-6 minutes or until no longer pink. Stir in garlic, oregano, cumin, coriander, chili powder, cayenne and kosher salt. Add chicken broth and 2-3 Tbsp of adobo sauce from chipotle can. Reduce heat and stir, scraping any stuck pieces into the mixture until most of the liquid has evaporated. Scrape mixture into medium mixing bowl and stir in half of your cheese: half cheddar and half monterey jack. Rinse skillet and dry with towel then, spread a single overlapping layer of tortilla chips (4 oz). Spread about 1/3rd the remaining cheese and half the beef mixture over the tortilla chip layer. Then add another layer of chips and beef. Then turn your stove burner or other flame source on high. Hold a bell pepper firmly with fire-safe metal tongs or by spearing it on a large fork and place it in the flame. Within 30 sec your pepper should show charred spots, let them expand then turn the pepper. Keep watching and rotating in the flame until about half the pepper’s surface shows some charing, then repeat with the second bell pepper. Thin cut the charred bell peppers (careful: they will be hot) into 1/4″ slices, discarding the seeds and interior flesh. Then toss in Jacobsen Smoked Sea Salt. Place charred & salted bell pepper strips over the top tortilla-chip and beef layer, then top with the remaining cheese and crushed red pepper. Bake at 400 degrees for 15 minutes, or until cheese or chips show some browning. While nachos are baking, mince three Adobo sauce covered chipotle peppers along with their seeds. Mix into 8 oz sour cream in serving bowl. Remove skillet from oven and let cool for a couple minutes before sprinkling with cilantro and serving with chipotle sour cream. Be careful – the skillet will be hot. Enjoy!